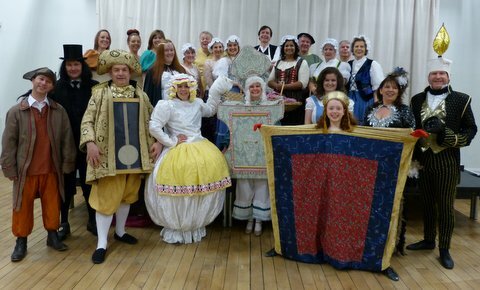 Bollington Light Opera Group present the musical based on the hit movie. Music by Alan Menken, lyrics by Glenn Slater, book by Bill and Cheri Steinkellner, and additional book material by Douglas Carter Beane. 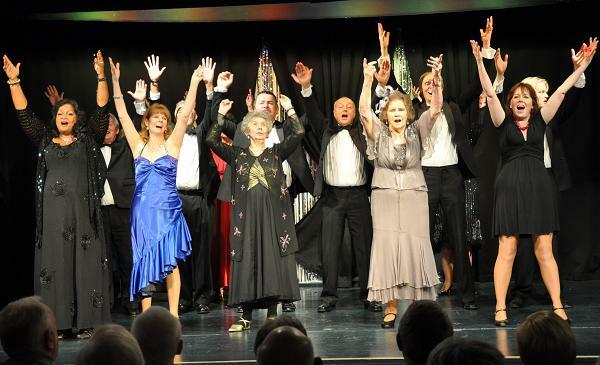 The Bollington Light Opera Group, affectionately known as BLOG, has entertained Bollington audiences for more than 40 years with a wide variety of high quality musical theatre performances. We generally provide two shows each year, in May and November, in a five day run (Tuesday – Saturday) with a matinee performance, ideal for children, on the Saturday afternoon. 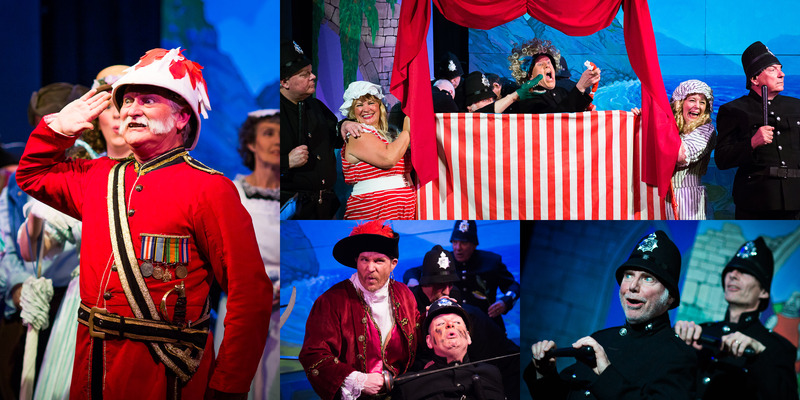 The May production is normally a well known and much loved musical (see examples below), and in November we put on a variety production called ‘Showtime‘ in which we perform popular songs from a variety of well liked shows. There is always an emphasis on dancing, colour and humour, as well as the music and our good voices! Tickets for the shows invariably sell out so get your order in early! 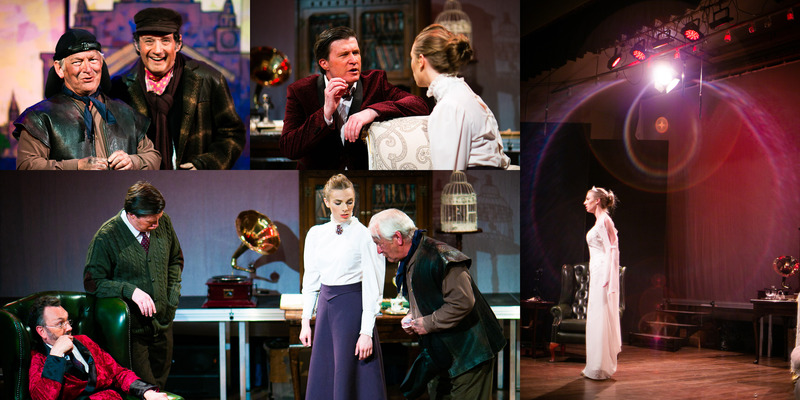 New members, both on stage and back stage, are always welcome – do get in touch with us! Bollington Light Opera Group performed to much acclaim this well loved musical show, in May 2017. The show told the story of Tracey Turnblad, who discovers the reality of discrimination in 1960s Baltimore, USA, when she gets herself onto a local TV dance show. Can Tracey, naïve but determined, and with her heart in the right place, put the world to rights? You bet she can! 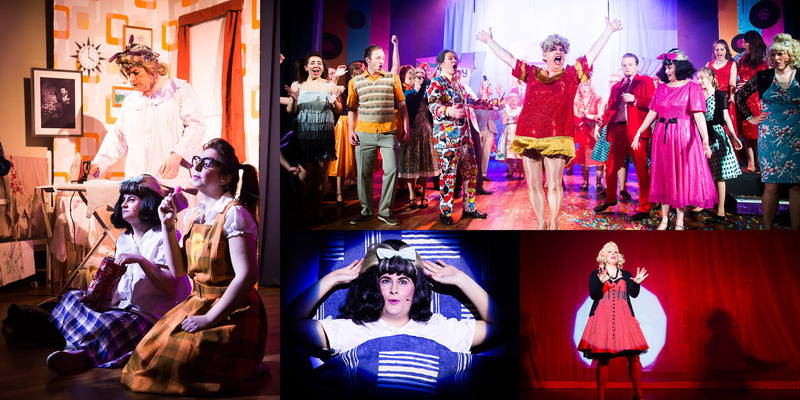 Energetic, emotive and above all tremendous fun, “Hairspray” swings along with strong leading characters and chorus producing great music right up to the final number “You can’t stop the beat”. The show’s directors were Diane McIntyre and Matt Gratton, who also directed BLOG’s hugely successful “Oliver!” two years ago. They assembled a strong cast with Rebecca Hart as Tracey with a supporting principal cast including Emma Sheldon, Helen Valentine, Michael Scott, Richard Comish,Emily Bancroft, Andy Venables, Steph Evans, Charlotte Foden, Carol Pratt, Kalini Kent and Paul Yandell. The part of Tracey’s mother Edna developed into a modern iconic role thanks to John Travolta’s performance in a film version, and Craig Harris stepped into illustrious (high-heeled) shoes for BLOG. The show’s musical director was Ian Jones. 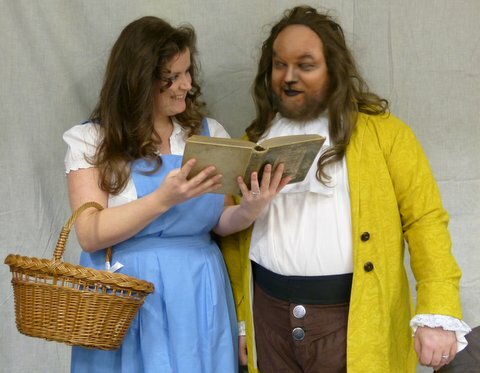 The classic Disney fantasy “Beauty and the Beast” was brought to the local stage by Bollington Light Opera Group in May 2013. The stage production, which made its debut in 1994, is based on the popular Disney animation of the same name, and had nearly 5,500 performances on Broadway, making it the eighth longest running show in the history of the mecca of musical theatre. The timeless story of how the essential goodness of human nature triumphs over evil represents a major challenge to BLOG, with a plot featuring a vain and uncaring prince, transformed by an enchantress into a hideous Beast and his servants into various household objects. The enchantress gives him a rose to use as an hour-glass, telling him the only way he can break the spell is to learn to love another and earn her love in return by the time the last petal falls. The prince seems to be doomed until Belle, a beautiful girl from the nearby village, is drawn into the plot and a race against time begins. Will Belle teach the prince the error of his ways before the rose sheds its last petal? Or will the prince be destined to live out his days as a lonely and hated monster? 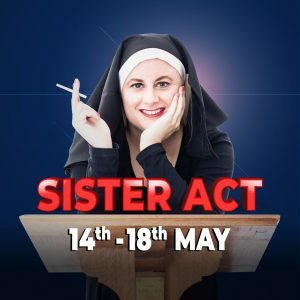 Director Mike Raymond and Musical Director Andrew Burr have assembled a strong cast to bring out every element of drama and comedy, alongside powerful and poignant solo numbers and boisterous chorus scenes, all of which will test BLOG’s membership to the full. Tavis Hill took the part of the Beast, with Katherine Cooke as Belle, while Nigel Wells played Gaston, the village bully who sets his sights on Belle. Other village characters were played by Jon Weinberg, who was Le Fou, Gaston’s sidekick; Paul Shortt, who was Belle’s father Maurice; and Paul Yandell, who was M. D’Arque, keeper of the local asylum. In the castle, Diane McIntyre was Mrs. Potts, the cook transformed into a teapot. Playing other key characters among the prince’s staff were Richard Comish as Lumiere, the stiff and starchy maitre d’ transformed into a candlestick; Craig Harris was Cogsworth, the flamboyant major domo transformed into a clock; Carol Pratt was Madame La Bouche, a retired opera singer who was housekeeper and transformed into a wardrobe; and Angela Theobold, as Babette, French maid transformed into a feather duster. In support was BLOG’s renowned chorus. BLOG has been producing musical theatre for its Bollington audiences at the Civic Hall since 1974. Their early years saw them perform most of Gilbert and Sullivan’s operettas, but they later developed into more mainstream musical theatre. 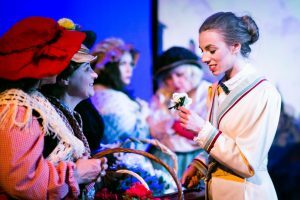 Fiddler on the Roof, Hello Dolly, Anything Goes, Calamity Jane, South Pacific and The Sound of Music have all wowed capacity audiences in recent years, but BLOG have occasionally gone back to their roots with excellent productions of The Gondoliers, The Pirates of Penzance and The Mikado. 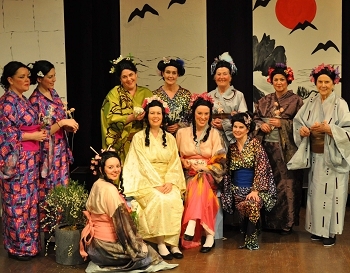 Bollington Light Opera Group brought an Oriental flavour to the town with their May 2012 production with a great performance of Gilbert and Sullivan’s The Mikado. The Mikado is classic Gilbert and Sullivan, whose works were the cutting-edge of satire of the early 20th century, regularly lampooning authority figures as clueless, pompous individuals. Nowadays, their works are loved as much for their humour and timeless melodies as much as for their satire. The action in The Mikado centres on the quiet Japanese town of Titipu, where life is turned upside-down by the arrival of an outwardly innocent wandering minstrel, who is not quite what he seems. Director, Denise Holian assembled an experienced and talented cast. 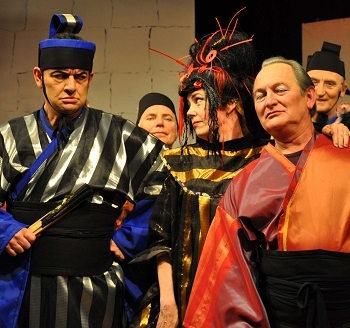 Craig Harris took the title role of The Mikado, pursuing his errant son, Nanki-Poo (Paul Yandell), who has fallen in love with a local girl Yum-Yum (Sharon Davies). They are both alarmed by the appearance of Katisha (Diane McIntyre) a mature lady, briliantly made up for the part, who also has designs on Nanki-Poo. 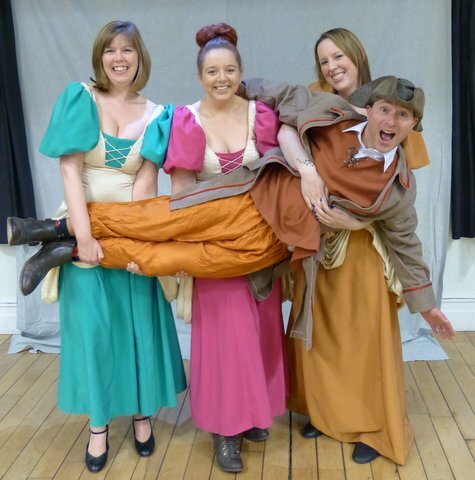 The town’s executioner (Mike Raymond) with local officials Pooh-Bah (Nigel Wells), Pish-Tush (Tavis Hill), and Yum-Yum’s sisters, (Stephanie Evans and Emma-Claire Sheldon), hatch an elaborate plan to foil The Mikado and Katisha, but things begin to go horribly wrong! The principals were wonderfully supported by the renowned BLOG chorus. Sheila Kent was the show’s excellent musical director with six musicians in support. The Japanese costumes were absolutely stunning! Denise Holian said before the performance: “This will be my first production in a few years and I am looking forward to seeing this super cast, supported by an experienced crew, perform during the show week. Our loyal audiences will be delighted to hear that this particular version of The Mikado will be staged in traditional Japanese dress, with all costumes being specially created just for BLOG”. “Fiddler on the Roof!” a great success! Performed at Bollington Civic Hall in May 2011. “Fiddler on the Roof” is one of the most popular musicals of our time. First performed in 1964, it held the record for the longest running show on Broadway for 10 years. Central to the story is Tevye, a Jewish milkman (and father of five daughters! ), living in the Tsarist Russia of 1904, and his attempts to maintain his family and religious traditions, while outside influences threaten to encroach. The 1971 film won three Oscars and made a household name out of Topol, who played Tevye, but this evergreen show is notable for the wonderful music from the songwriting team of composer Jerry Bock and lyricist Sheldon Harnick, running alongside rich characterisations. Kalini Kent, made her directorial debut for BLOG, assembled a strong line-up of principals. 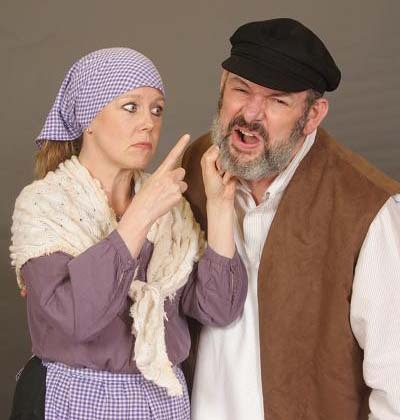 Craig Harris, an award-winning local actor (left), played Tevye, while Diane McIntyre (left), (Dolly in last year‘s show), took the role of his wife Golde. They were supported by a wealth of talent, with many familiar faces and some who were new to the society, including some very promising young performers! Musical Director was Heather Hayes-Wilson. The show was another sell out for ever-popular BLOG! A medley of favourite songs from the shows including Fidler on the Roof, My Fair Lady and the Merry Widow were beautifully sung and presented by the singers and compèred most entertainingly by Mike Raymond. The company included Peter Burke, Andrew Burr (Musical Director and Piano), Craig Harris, David Kent, Kalini Kent, Peter Kent, Sheila Kent, Diane McIntyre (Producer and Director), Lynne Patrick, Pat Penney, Kath Portlock, Carol Pratt, Pam Puddle, Mike Raymond (Compere), Michael Scott, Jean Snaith, Paul Yandell, Graham Lawson (Lighting) and Ruth Stubbs (Tickets and House Management). All proceeds from this event went to the Mayor of Bollington’s Senior Citizens’ Fund. The Mayor, Cllr Mrs Angela Williams (left), expressed her grateful thanks to the company for their wonderful show and great generosity in staging the show for the benefit of the Senior Citizens. The cast singing their hearts out in the finale – New York! New York! – of their Evening of Entertainment, Song and Laughter in aid of the Arts Centre Roof Fund, 12 April 2008. This was enormously enjoyed by the sell out audience which included BLOG’s President, Sir Nicholas Winterton DL MP. The cast included Helen Valentine (centre who Produced the show), Steph Evans (Assistant Producer), Sheila Kent (Musical Direction and Piano), Carol Pratt, Jo Leighton, Jean Snaith, Kirsten Pearson, Lynne Patrick, Sharron Davies, Kath Portlock, Peter Kent, Peter Cliffe, Paul Yandell, Anthony Davies, Craig Harris, Michael Scott, Dave Taggart, Tavis Hill, Paul Ratcliffe and the whole show was Compèred by Mike Raymond. Back stage support was provided by Graham Lawson (Lighting and sound) and Ruth & Graham Stubbs (Ticket sales). We meet at the Arts Centre every Thursday at 8.00pm (except in show weeks). We present two shows each year plus a number of social functions.